With society's growing use of drugs and substances of abuse, health care professionals need to be aware of how the drugs patients use afefct behavior, cognition, learning, memory, and other aspects of mental and physical health. physicians, other prescribers, and pharmacists need to know the abuse potential and current "street use" patterns of prescribed drugs, and all health professionals need to recognize signs and symptoms of drugs or substance intoxication, overdosage, and withdrawal. 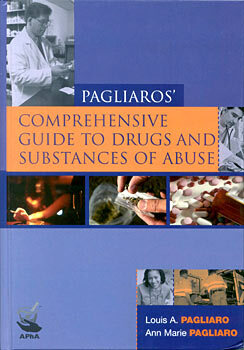 Pagliaros' Comprehensive Guide to Drugs and Substances of Abuse offers a timely, authoritative, referenced analysis of trends in abuse of both prescribed medications and illicit substances not covered in standard therapeutics texts. Health care providers will quickly find information on specific drugs or substances in 101 individual monographs. Major chapters on the psychostimulants, and "psychodelics" provide an overview of the history, pharmacology, and patterns and theories of use of the drugs and substances in each category. 101 monographs presented in alphabetical order by generic or common name; each includes street names for the drug or substance, as well as a brand or trade names. Comprehensive index includes all the generic, brand/trade, and street names. Co-authors have over 60 years of combined experience as educators, consultants, and clinicians in the field and have previously authored or co-authored a dozen clinical pharmacology textbooks, including two focusing on drug and substance abuse. Louis A. Pagliaro, MS, PharmD, PhD, FABMP, FPPR, formerly professor of pharmacy and pharmaceutical sciences, is prefessor of pharmacopsychology and chartered psychologists specializing in the treatment of patients with dual diagnosis. Ann Mari Pagliaro, BSM, MSN, PhD candidate, FPPR, is professor of nursing and director of the Substance Abusology and Clinical Pharmacology Research Group. Both have been at the University of Alberta since 1977. They have published, collaboratively and indivudually, more than 300 professional review and research articles and several invited chapters on drug and substance abuse. In addition to consultin for many public and private organizations, they have presented numerous workshops on pharmacotherapeutics and drug and substance abuse. This is their 13th textbook.